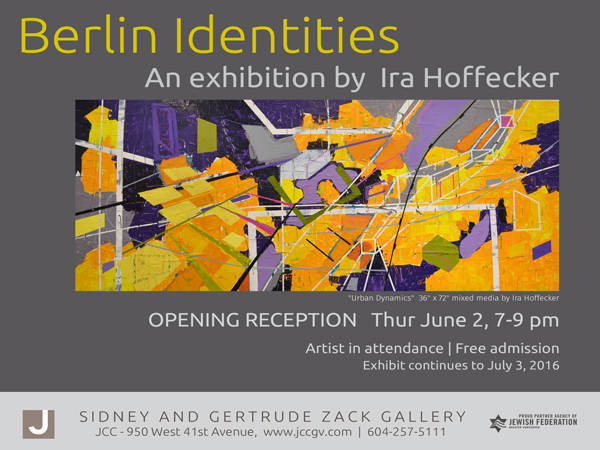 Enclosed please find the invitation to my upcoming exhibition ‘Berlin Identities’ at the Jewish Zack Gallery in Vancouver. For this exhibition I have prepared a number of paintings that talk about the former Jewish quarter in Berlin, the Scheunenviertel and its different identities. Opening will be on Thursday June 2nd, 7 to 9pm and the exhibition will run until July 3rd. It is a huge honour for me to be invited to show my work at the Zack Gallery, 950 West 41st Ave. in Vancouver, BC. Please feel free to forward this invitation, if you have friends in Vancouver, who might be interested in seeing my work. Also I am happy to let you know that my painting ‘Camp Moschendorf II’ has been shortlisted together with 53 other paintings for this year’s John Moores Painting Prize 2016 in Liverpool, England. The paintings will be exhibited as part of the Liverpool Biennale at the Walker Gallery in Liverpool from July 9th to November 27th 2016. Thank you so much for your support. Looking forward to seeing you soon.